Though I do not recall previously discussing my personal sports proclivities in this blog, I am a serious practitioner of fitness-type sports such as hiking, biking, swimming and gym-workouts, but I have only the barest minimal interest in spectator sports. 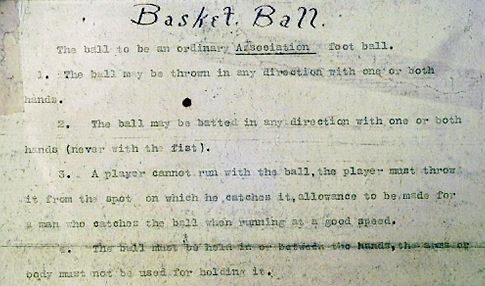 That said, Sotheby's sale in New York this week of James Naismith's founding document for basketball was a spectator sports event that I did enjoy. As far as I know, basketball is the only sport the foundation of which can be traced to a specific document. 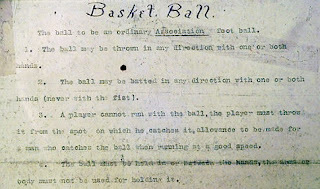 Naismith's typed and handwritten document setting out in December 1891 the thirteen rules for the new sport of "Basket Ball" is that document. It was preserved by members of Naismith's family, and was sold to benefit the Naismith Foundation and Museum. To promote the sale Sotheby's published a separate catalogue which was available online. The 2-page document sold for $4,338,500, including buyer's premium. According to CBSsports.com, the buyers were David and Suzanne Booth, who intend to donate the manuscript to the University of Kansas, of which Mr. Booth is an alumnus. Naismith joined the University of Kansas faculty in 1898, becoming the first basketball coach there. Any type of computer system tool to obtain your Fidelity online account. 401k fidelity login You can likewise establish login.fidelity.com as your web browser homepage. On the most straightforward dimension, science is learning of the universe of nature. There are numerous regularities in nature that mankind has needed to perceive for survival since the rise of Homo sapiens as an animal categories. The Sun and the Moon occasionally rehash their developments. A few movements, similar to the every day "movement" of the Sun, are easy to watch, while others, similar to the yearly "movement" of the Sun, are unquestionably increasingly troublesome.Refer best essay writing service to get the expert writers. Glad that history not only found in books now.